As part of a social experiment, the researchers created four fictitious job candidates – each with a unique name that most likely points to someone who is male, U.S. born and Caucasian. The candidates had identical resumes. The researchers also created social network profiles for each of the candidates that revealed either his sexual orientation or whether he was a Muslim or Christian. All other information, including the profile photograph used for each candidate, was the same. The resumes, which did not mention the candidates’ online profile, were then sent out to more than 4,000 employers nationwide with job openings. Readers should note that the study’s authors did not design the pool of open jobs to be representative of all jobs available in the country, or in Republican-leaning or Democrat-leaning states. The number of job vacancies varied from state to state, and overall, a smaller share of all open jobs was located in Republican states. In both Republican and Democratic states, there was no difference between the call backs received by the gay candidate as compared with the straight candidate. But in the Republican states, the Christian candidate received more interview calls than the Muslim candidate. In the 10 states with the highest proportion of Republican presidential candidate Mitt Romney voters in the 2012 election, 17% of Christian applicants received interview calls, compared with 2% of the Muslim job candidates. There were no differences in call backs received by the Christian and Muslim candidates in the 10 states with the lowest proportion of Romney voters. 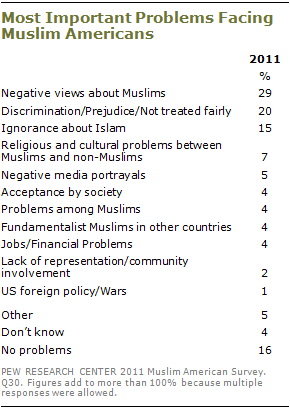 The study is not the first to pick up on perceived negative views of Muslims in America. Nearly half of Muslim Americans pointed to either negative views about Muslims (29%) or discrimination and prejudice (20%) as the most pressing issues facing their community in a 2011 Pew Research Center survey. At the same time, however, more than half (56%) of Muslim Americans surveyed also said that they are satisfied with the way things are going in the country. The Carnegie Mellon study also seems to support our findings about workplace treatment of lesbian, gay, bisexual and transgender Americans. An overwhelming proportion of LGBT Americans say they are more accepted in society today than they were 10 years ago, according to our 2013 survey. When asked about specific experiences with discrimination, 5% of LGBT Americans say that in the past year they have been treated unfairly by an employer because of their sexual orientation or gender identity.